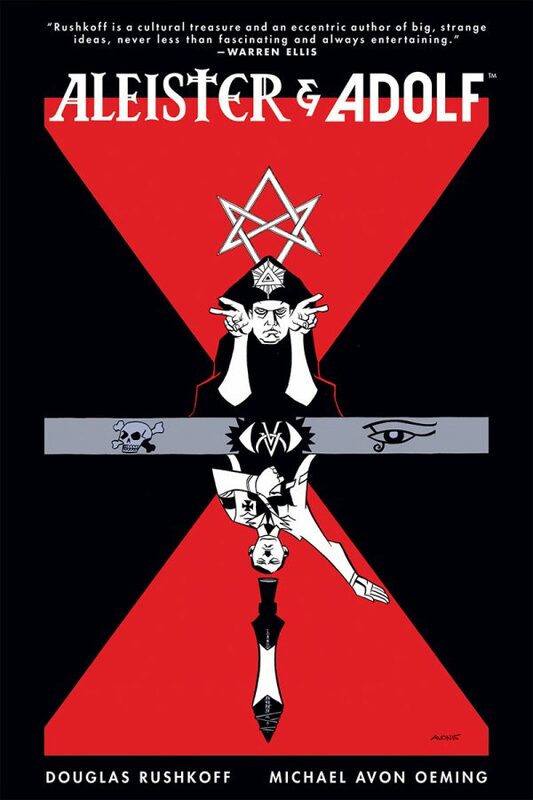 This month, Dark Horse Comics released the graphic novel Aleister & Adolf, a book from the minds of Douglas Rushkoff and Michael Avon Oeming. A tale that begins in the jaded here and now of our modern tech age and journeys back to the cusp of World War II as Nazi Germany begins its reign of terror. As the story begins we come across Hugh, a young techie, who is having trouble inserting a logo he has created for his companies’ web page. What seems like a simple glitch turns into something far more sinister. Douglas Rushkoff, who was named by MIT as one of the world’s most influential intellectuals of our time and creator of countless documentaries, takes us on a ride thru history and the depths of magic and mysticism. As the infamous Aleister Crowley is recruited in the fight against the Nazi regime, we learn just how powerful the master of the occult is against the diabolical forces of Hitler himself. Throughout our story of mysticism and war, we learn the power of signs and ceremony and how they still affect us in the modern world. With a blend of magic and technology we are treated to a story that resonates in this modern time. The artwork by Michael Oeming is a stark black and white with the occasional grey wash that creates an environment which suits the mood of the story with its detail to the mystic symbols and rituals that gives it an almost dream like quality. A great book visually and story wise.